Ammunition Capacity: 28 shot magazine. Trigger Pull: The trigger pull on the Anics Skif A-3000 in single action is fairly good and short, not light but far from heavy. 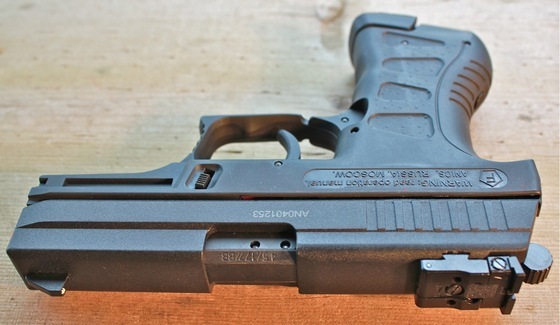 When shooting in double action mode, it does get significantly heavier do to the 28 round rotary magazine friction. Overall it is fairly smooth in double action mode but once in a while you can hit a bit of a sticky spot in the rotation. With that said I was expecting it to be worse and found it usable for me. Accuracy: I shot this air pistol at a target from 20 feet away in a free standing position in single action mode and it performed well getting a very respectable 1.5 inch grouping pretty much right on the target. The sights can be adjusted for windage and elevation if your aim is not centered, I had to adjust mine up almost 4-5 inches from the factory settings. With my Chrony Chronograph testing using 7 grain lead pellets I got right up into the low 400fps (8 shot average of 417 fps) and would expect BB's to shoot a bit faster. Build Quality: The Skiff A-3000 uses a metal slide and polymer frame, there are also lots of metal parts used in the gun like the barrel, slide catch, safety, hammer and sights. Even though it only has a claimed weight of about 1.6 pounds, it feels heavier in the hand. The mechanics seem solid and well designed. Realism: The Anics Skif A-3000 looks a bit like a mix between a Glock and a Walther P series semi auto hand gun but it is very unique looking. 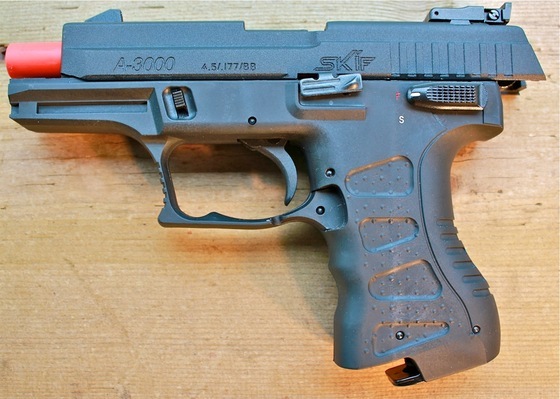 The Skif A-3000 looks the part of a real gun for sure, but exactly which gun is hard to say! Good overall construction with gun like parts and assembly. 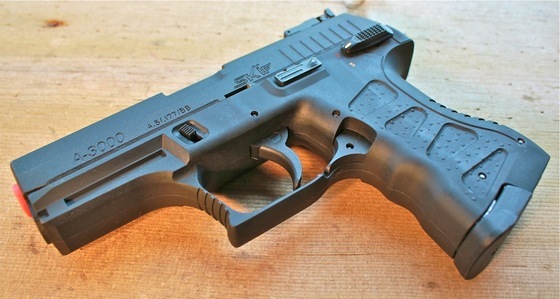 Very solid feeling gun with an ultra modern look. Good accuracy and very good power. High capacity 28 round magazine. Can shoot both pellets and BB's. Double and single action trigger. Very unique gun, not a lot around here in North America. Heavy trigger pull in double action mode, but still usable. Red barrel on this one, not necessary in North American market. Rear sight had to be adjured way up on my Skif A-3000. The Anics Skif A-3000 is a very cool gun, nothing looks or works exactly the same with its 28 round pellet loading rotary magazine and ultra modern looks. Sure it has a heavy double action trigger and it's always nice to have blowback but on the other hand the tradeoff is more power and a super high capacity magazine. Combine that with a fully adjustable rear sight, rifled barrel, single and double action trigger and the ability to shoot both pellets and BB's and you have a real winner here.